Looking east from Harrison Street today. If you drive along Albany’s riverfront, you will have noticed that work began today on the second phase of rebuilding Water Avenue and the railroad track in the middle of it. Four blocks of the street, from Main Street to Harrison, were done last summer. This morning a contractor for the Portland & Western Railroad (PNWR) got started lifting sections of concrete that cover the cross tries and ballast on the remaining three blocks from Harrison Street to Geary. 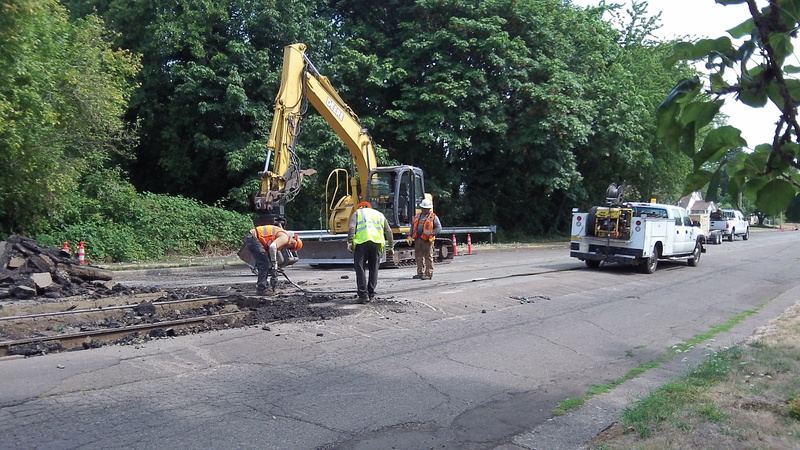 Once the railroad is done straightening the rails, a contractor for the city of Albany will replace the paving on the traffic lanes and repair the sidewalk. Salem Road & Driveway submitted the lowest of five bids for the paving job at $115,235 and was awarded the contract. Chris Cerklewski, project manager for the city, says the whole thing should be finished by the middle of September. Drivers in the neighborhood — and cyclists whose routes include that stretch — are looking forward to a smoother ride. 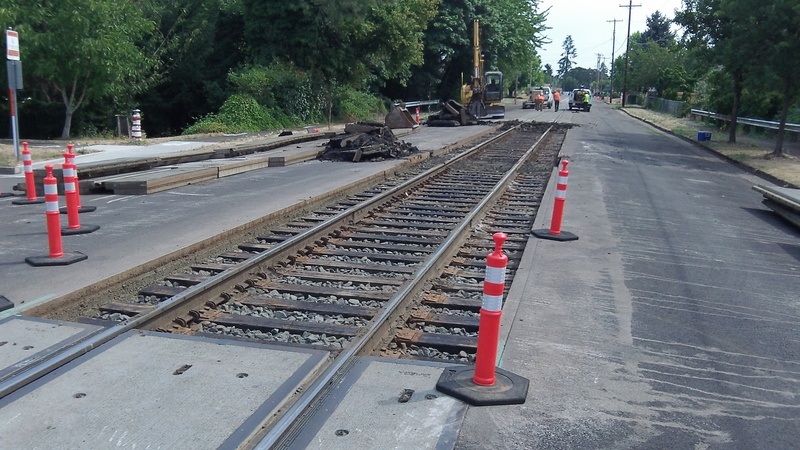 The section of the street with the railroad down the middle had been in poor shape for years, but repairs had to wait until the city and the PNWR, along with the track’s owner, the BNSF, concluded a new franchise agreement last year.